Problem: Create a multiplication table to help your kids in school. In Fig. 176 (click any image for a larger view), you want to enter a single formula in cell B2 that can be copied to the entire table. 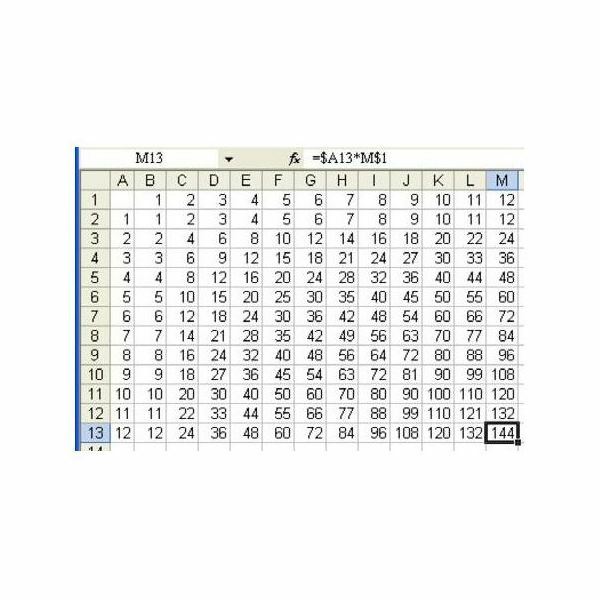 The beauty of using the method described in the next section to create the multiplication table is that it takes basically the same amount of time to make a quick table that gives results for multiplying any two numbers between 1 and 12 as it does to make much larger tables. So, feel free to experiment and make your table with any dimensions you like. 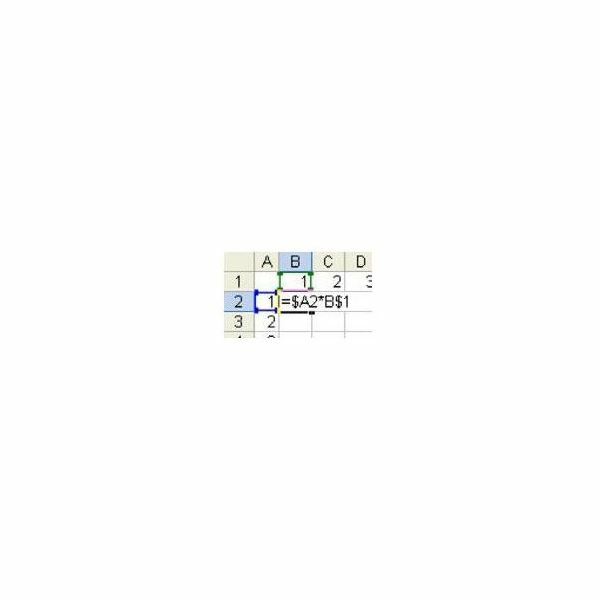 In a previous lesson, you learned how to use an absolute reference in Excel, such as $C$1, so that Excel would not change from column C or row 1 as it copied the formula. To create a multiplication table, you need to use a mixed reference. A mixed reference, such as $B1, will lock the formula to column B, while allowing the row to change. A mixed reference, such as B$1, will lock the row to row 1, while allowing the column to change. 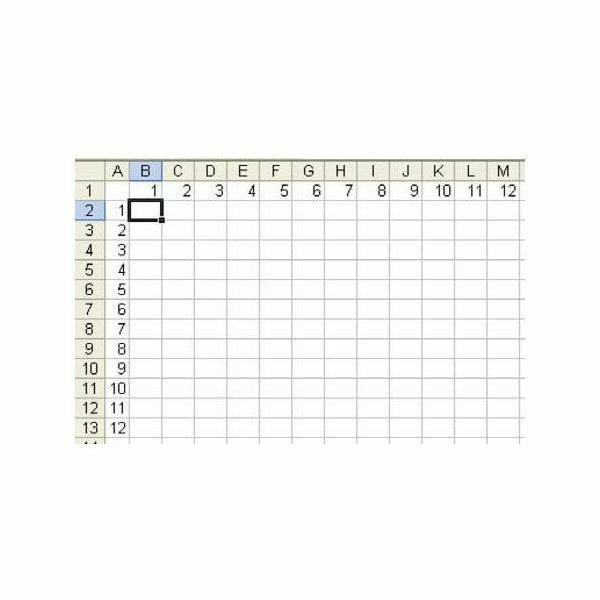 The formula that you need for the multiplication table is a formula that will multiply whatever is in row 1 above the cell by whatever is in column A to the left of the cell. To have a reference that always points to row 1, use something in the format of B$1. To have a reference that points to column A, use a reference in the format of $A2. 1) As shown in Fig. 177, the formula you want to enter in B2 is =$A2*B$1. 2) Copy the formula in B2 to the entire range, and it will always properly multiply row 1 by column A as shown in Fig. 178. Summary: Using a single dollar sign in a cell reference will create a mixed reference. Only the row or column will be fixed as you copy the formula. For more Excel tips and tricks, be sure to check out the hundreds of other articles in Bright Hub’s vast collection of Excel user guides. In particular, you may be interested in one of the following articles. 91 Tips for Calculating with Microsoft Excel – This directory links to a collection of 91 Excel tips, compiled by Bill Jelen, also known as Mr. Excel. Here you’ll find quick and easy solutions for everything from extraction portions of a cell value to calculating multiple scenarios for a loan payment. How to Use Functions in Microsoft Excel – Learn more about the various functions available in Excel and when to use them with these easy-to-understand explanations that include screenshots and examples. Excel Formatting Tips from Mr. Excel – Having trouble getting your Excel chart or table to look just right? Or, do you want to learn simple formatting tricks that can help you better organize and analyze data? You can find all of this and more in this collection of Excel formatting tips, written by Mr. Excel.